1College of Clinical Pharmacy, Imam Abdulrahman Bin Faisal University, Dammam, SAUDI ARABIA. 2Natural Products and Alternative Medicines, College of Clinical Pharmacy, Imam Abdulrahman Bin Faisal University, Dammam, SAUDI ARABIA. 3Department of Pharmaceutics, College of Clinical Pharmacy, Imam Abdulrahman Bin Faisal University, Dammam, SAUDI ARABIA. 4Department of Pharmacy practice, College of Clinical Pharmacy, Imam Abdulrahman Bin Faisal University, Dammam, SAUDI ARABIA. Background: Aloe vera (AV), mostly known as succulents, or the healing plant of the genus Aloe of Liliaceae family. It contains large range of vitamins, amino acids, antiseptic, antiinflammatory, and sulfur compounds to control and eliminate mold, bacteria, viruses; however, AV toxicity is most of the times described poorly among AV consumers. Aim of the Study: To report and highlight AV clinical uses and toxicity cases to compare and highlight its therapeutic as well toxic profile. Materials and Methods: AV cases were gathered from databases such as Google Scholar, PubMed, Web of Science, Scopus, and E-Resource Portal of Imam Abdulrahman bin Faisal University using the keywords, i.e., AV case report, AV toxicity, hepatitis, clinical trials about AV, interactions, the current uses of AV, etc. Results: Ten cases met the eligibility criteria where the toxicities were mostly associated with the usage of AV except the intended use, i.e., to be administered topically or AV capsules ingestion or as a drinkable solutions. Major symptoms observed in these cases were related to hepatocytes inflammation (hepatitis), fatigue, nausea, vomiting, thyroid dysfunction, abdominal discomfort, and diarrhea along with severe weight loss. These results were not associated with a specific age; however they were more predominant in female gender. Conclusion: AV should be taken within normal/specified dose range which can only be achieved through asking an herbal specialist, and in approved suitable dosage form which is topical. Ibrahim AM, Sadah HA, Ahmad R, Ahmad N, Naqvi AA. 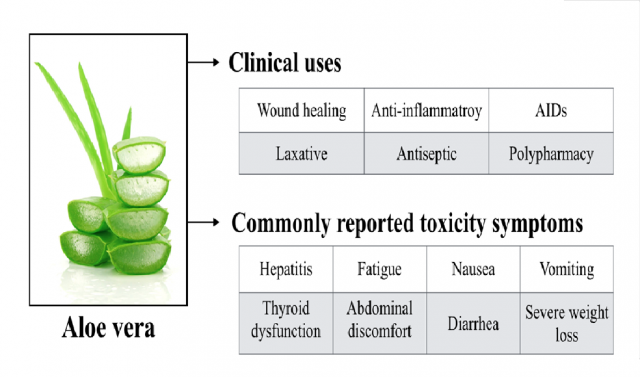 Clinical Uses and Toxicity of Aloe vera: An Evidence-Based Comprehensive Retrospective Review (2007-2017). Pharmacognosy Journal. 2019;11(2):424-428.